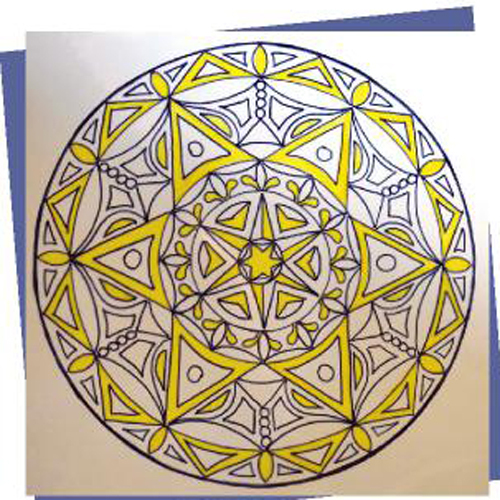 Project Description: Create your own rose window designs with Grafix products. 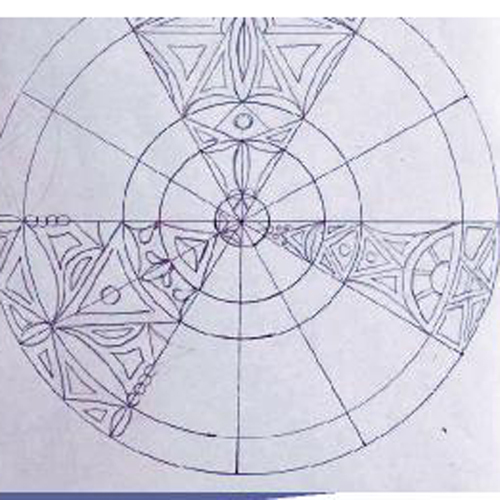 Begin by looking at examples of rose windows from a variety of countries and periods of time. On a 9′ x 12′ piece of paper, find the approximate center and draw 5 – 6 concentric circles. 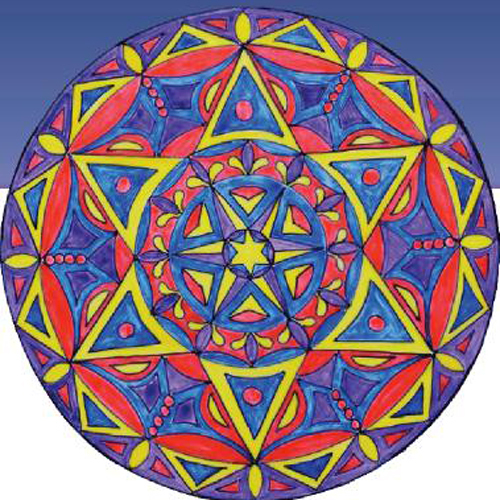 (Don’t lift your compass; draw them one after another to ensure they maintain the same center). Use a ruler to draw a line straight though the center of the circles. Lay your protractor down on the line you just drew with the tiny hole in the protractor on top of the point that is the center of all of your circles. Measure so that you divide the circle (360 degrees) into 12 equal pieces. This means you need to divide 360 by 12 which gives you 30. Now you will make a mark at 30, 60, 90, 120 and 150 degrees on the outside of the protractor. Lay the ruler down on the mark you just made at 30 degrees, make the other end of the ruler pass directly through the center of the circles and draw a line all the way across the entire circle. Repeat for the remaining marks at 60, 90, 120 and 150 degrees. Make sure to keep one end of the ruler on the center and the other on your mark when drawing the lines or your pieces will not be even. Now you are ready to create. 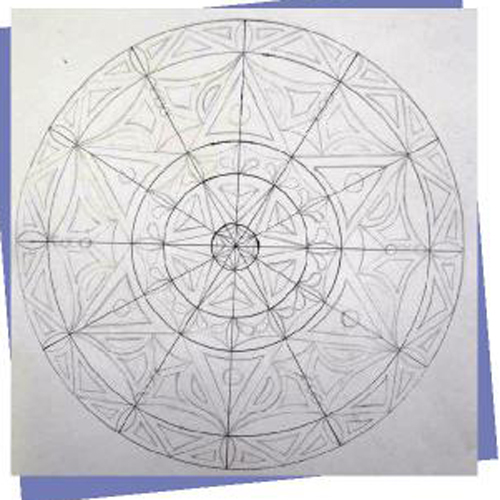 Break up each piece of the rose window using simple lines and shapes. Stay away from symbols and drawings that cannot easily be repro¬duced with great accuracy. Work in one or two pieces of the pie to create a design. You can try several different ideas in other pieces. Once you find a design that you like, you are ready to transfer it to the Dura-Lar wet media film. Place the Dura-Lar wet media film on top of your design and carefully trace the circles and lines and then carefully trace the design you chose into each of the spaces with a permanent marker until all 12 are filled. Experiment with color combinations on your practice piece or retrace the piece a few times to make sure the colors work well together. 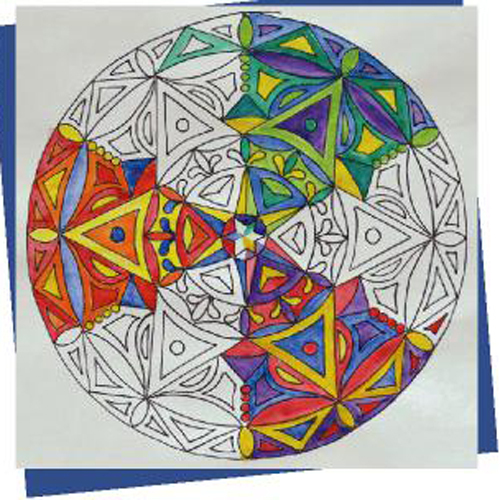 Add color to your rose window design with watercolor or permanent marker. When it comes time to paint, work your way around the layers painting all of one color and then moving to the next once the first areas are dry. This will keep the watercolor from bleeding into the piece you just painted. It also helps to use just a small amount of watercolor without a large amount of water so that there is less chance of it spilling into areas where you don’t want. If it does go in to areas it shouldn’t, use a paper towel to soak up as much as you can, wait for it to dry and go over it with the correct color. Cut a black mat from construction paper or black poster paper and hang designs in a window for a dramatic display. Tips: Don’t move the compass until all of your circles are drawn. Measure the angles accu¬rately or the designs will not work out. Try to vary the designs from one layer of the wedge to the next so that you are not always using straight lines, or always curved lines; mix them up from layer to layer to add interest.